Researches into their Ancient and Medieval Relations as Represented in Old Chinese Records. ARES Publishers, inc., Chicago, 1975. Unchanged reprint of the edition : Shanghai & Hong Kong, 1885. Extrait de l'introduction : "The mystery connected with that country in the Far West, described by ancient Chinese authors under the name of Ta-ts’in, has occupied the sinological world at intervals since the beginning of the last century. The task which I thought had still to be performed in connection with this interesting subject was : 1. The collection of all Chinese texts embodying information on the subject ; 2. The translation of these texts as far as they were new to the public, and the retranslation of portions already known but hitherto imperfectly rendered ; 3. The identification of facts contained in these Chinese texts. My interpretation of these records leads to the conclusion that the ancient country of Ta-ts’in, called Fu-lin during the middle ages, was not the Roman Empire with Rome as its capital, but merely its oriental part, viz., Syria, Egypt and Asia Minor ; and Syria in the first instance. 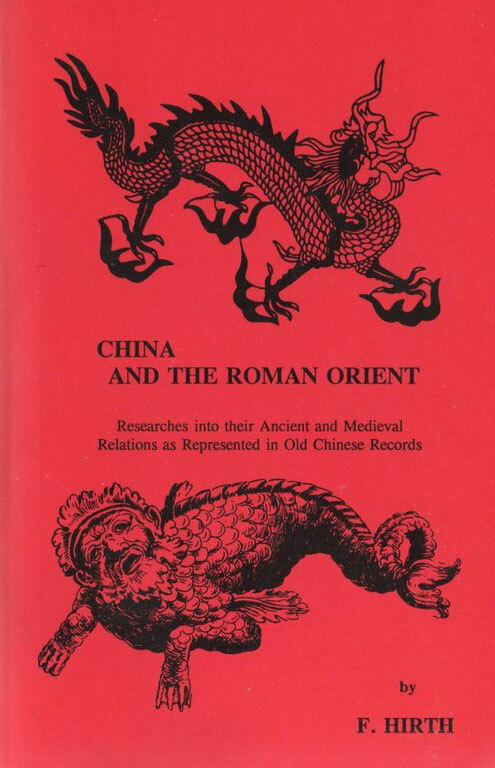 If applied to the Roman Orient the greater part of the facts mentioned by the Chinese can be traced, and a reasonable explanation may be found for them without resorting to improbabilities ; while, if applied to the whole empire, or to Italy, or to any other part of ancient Rome, the matter contained in the Chinese tradition does not agree with reality." Extraits : Petra, the great emporium - From the Euphrates to Petra - Chinese embassies to Rome ? 2. TRANSLATIONS AND CHINESE TEXT. EXTRACTS. Ancient route from Central Asia to Ta-ts’in. Li-kan and T’iao-chih. Kan Ying’s mission. An-hsi identified with Parthia. The earliest account of An-hsi. The later (Hou-lian-shu) account of An-hsi. Hekatompylos. Mu-lu identified with Antiochia Margiana. T’iao-chih identified with Chaldaea. Li-kan T’iao-chih may be the Seleucid empire. The ‘western sea’. The ‘city of T’iao-chih’ on the peninsula in the Chaldaean Lake. The kingdom of Hira. Yü-lo identified with Hira. Overland route from Hekatompylos to Chaldaea. Acbatana, Ktesiphon. The Euphrates and Tigris. Orchoë. ‘The port of Ta-ts’in’, and the periplus of the Erythraean Sea. Outlets of Roman trade in the Red Sea. Egyptian and Nabathaean ports. Phœnician dyeing and weaving industries probably diverted the silk trade to Nabathaean ports. Petra or Rekem. Rekem, an old seat of oriental trade and civilisation. Bifurcation of road at Rekem. Ta-ts’in lies between two seas. The sea trade from Chaldaea to Rekem. Speed of ancient navigation. Li-kan mentioned in early records. Various explanations of the name. Identified with Rekem. Early relations between the Chaldaeans and the Nabathaeans and the joint name Li-kan T’iao-chih. Alleged embassy to China of A.D. 166. The silk trade through Parthia interrupted through war and disease. The alleged embassy may have been a commercial expedition sent in order to re-open trade with China. Arrival of the first Ta-ts’in mission in China. Sea-route to the coast of Pegu. Route through Yün-nan. Roman trade through the Egyptian ports : the Nile route known in China. Alexandria in Egypt. Sea passage on the Mediterranean from Alexandria to Antioch. Overland-routes from Babylonia to Syria. The term jao-hai : ambiguousness of a passage in the Hou-han-shu. Mesopotamia. Analysis of routes mentioned in the Wei-lio. Dependent kingdoms. Tsê-san near the mouth of the Euphrates. Lü-fên may be the region of Osrhoëne. The flying bridge mentioned in Chinese records identified with the bridge of Zeugma. Difficulties in the text of the Wei-lio. Ssŭ-lo (Seleucia). The City of Madain and the Tigris. The site of T’iao-chih. Ch’ih-san is Alexandria, and not Byzantium. The Amazons. Information reaching China through Indian sources. The Pygmies. The Ichthyophagi. The City of Antioch identified as the capital of Ta-ts’in. Size of Ta-ts’in and Fu-lin territories. The number of cities in Ta-ts’in. Tigers and lions in Ta-ts’in. The Tsung (hymna, jackal ?). Roads and postal arrangements. The milliary system : parasangs, Arabian miles and stadia. Distances of various places quoted. Profit on trade with India and China. Articles of trade in ancient China. Balance of Roman oriental trade. Roman import trade in Chinese produce chiefly paid for in kind. Glass industry. Derivation of the word liu-li. The introduction of glass-making in China. Glass considered a precious substance in ancient China. Syria, the centre of trade in precious stones. Imitation gems. Employment of crystal in decorating pillars, walls, etc.. Crystal and glass confounded. The use of gems and precious stones in decorating walls, etc., is a local feature of ancient Syria. Sources of information regarding precious stones in Chinese literature. The “jewel that shines at night”. Gold, silver, amber. Gems probably came from the factories of Alexandria. Corals. Pearls, Textile fabrics. Purple-dyeing. Names of Ta ts’in piece-goods. Chinese modern names for broadcloth and Russian cloth. Asbestos cloth. The Roman Orient was the seat of the principal cloth industries. Embroidered textures, gold embroideries. Attalicæ vestes. Textures of several materials (silk, wool, linen, byssus). Musters and colours of Ta-ts’in rugs. Silk industries in Ta-ts’in. Chinese silk imported to be unravelled and re-woven. Coicæ vestes. The watersheep. Col. Yule’s and Dr. Bretschneider’s views regarding the water-sheep. Storax (su-ho) a product of Syria. Frankincense. The henna plant. Alleged introduction of papyrus rolls from Rome : the paper offered to China is Annam produce. Realgar, orpiment, copper, gold and silver. Theriac. Barter trade in Ceylon : the spirit or devil market. Analysis of records regarding Fu-lin. Mr. Phillips’ view of Fu-lin the correct one : the king of Fu-lin an ecclesiastical ruler. Fu-lin as the country of the nestorians. Old sound of the name Fu-lin. The name Fu-lin represents the sound Bethlehem. The Jo-shui or weak water of chinese legend-writers. The king of Fu-lin, Po-to-li, a nestorian (?) Patriarch. The capital of Fu-lin besieged by the Arabs. Fu-lin as a seldjuk province. Milikshah, the Seldjuk Sultan. The titles Sultan and Melek. Mi-li-i-ling-kai-sa. Damask blades and saddlery. Fu-lin physicians : trepanning. Chinese embassies alleged to have arrived in Rome. The Indian embassy under Constantine. The alleged arrival of Seres under Augustus. No official mission was sent from China to the west before Kan Ying. The mission of Ts’in-lun, a merchant from Ta-ts’in. Linguistic results. Only about 60 miles north of this port was the city of Petra, so called by Greek conquerors who translated one of its Aramaean names, Sela, i. e., rock, into their language , from the Greek name of which the Romans called the country Arabia Petraea. The principal local name of the city, however, was not Petra, but Rekem or Rekam. During the first two centuries A.D., Petra or Rekem was the seat of an immense commerce — the great emporium of Indian [and, we may add, Chinese] commodities, where merchants from all parts of the world met for the purposes of traffic. The city fell under the Mahommedan empire, and from that time to the beginning of the present century was nearly lost from the memory of man. When Burckhardt discovered its forgotten site in the year 1811, he found only a solitary column and one ruinous edifice left standing, of all the sumptuous structures that once crowded this romantic vale. “Under the auspices of Rome, Petra rose, along with her dependencies, to an incredible opulence. Unheeded in the desert, and for centuries forgotten, the stately ruins of the hill-encircled city and its chiselled rocks still remain an evidence that may not be gainsayed of the mighty traffic once passing through the marts of Petra, of the princely magnificence of her merchants, of the truth of history, and of the unerring certainty of prophetic denunciation. " “From the words of Pliny, one thing at least is certain, that at Petra the commercial road parted in two directions, one leading to the left, towards Gaza and the shores of Syria ; the other to the right, towards Palmyra”. “By the side of its sea one comes out at what is like an arm of the sea ; that the east and the west [of the country] look into that arm of the sea is a natural arrangement”. “there was something about the sea which caused one to long for home ; that those who went out could not help being seized by melancholy feelings ; if the Chinese envoy did not care for his parents, his wife and children, he might go”. “Ying could not take his passage”. “that, with favourable winds, the passage lasted two months ; that, with slow winds, it could last two years ; and that those who risked their lives in such an adventure, had to be supplied with three years’ provisions”. I cannot suppress an after-thought that this last piece of information was given him in order to justify a big price as passage-money, which may have had as powerful an effect on Kan Ying’s mind as the horrors of the sea described to him in such drastic language. Chinese embassies to Rome ? Just as the Chinese annals contain records of alleged embassies from western monarchs which, on close examination, we had to declare to have been private missions, allusions to Chinese embassies to Rome may be found in Roman authors, which, if approached in the same critical spirit, may be shown never to have been sent by the monarch from whom they alleged to come. Eusebius (Vit. Const. I, IV, c. 50, quoted in Gibbon, Chap. XVIII) speaks of an Indian embassy to the court of Constantine the Great (died A.D. 337), which may possibly be referred to China. He “remarks three circumstances relative to these Indians : 1. They came from the shores of the eastern ocean ; a description which might be applied to the coast of China or Coromandel. 2. They presented shining gems, and unknown animals. 3. They protested their kings had erected statues to represent the supreme majesty of Constantine”. This embassy must have arrived during the reign of Ch’êng-ti of the eastern Chin dynasty (A.D. 326–335) who ascended the throne when a child. It appears that Chinese annals are as silent on this point as Roman records are on the various missions to China mentioned in Chinese historical works. I have at least looked in vain for anything like an allusion to it in the T’ung-chien-kang-mu covering that period. It is hardly necessary to take the same trouble with regard to the Seres stated in Florus’ Epitome (IV, 12) to have been amongst the envoys of all countries who came to the court of Augustus (see Yule, Cathay, Vol. I, p. XLII), as the Chinese Annals clearly insinuate that Kan Ying (A.D. 98) was the first Chinese who ever penetrated as far west as T’iao-chih. The Chinese are, and have at all times been, so well at home in their own literature, that we may depend on this statement as a proof at least of no similar mission being mentioned in any recognised record as having gone further west previous to Kan Ying ; and this again implies that no Chinese has proceeded to the Far West in an official capacity, for such a fact would have been duly noted in the State Annals. If any Chinese subject did at all penetrate to the west, previous to Kan Ying, he must have been a private traveller, and one who either never returned to China, or did so without calling public or official attention to his journey. If the Seres mentioned by Florus were actually Chinese they must have come by way of India, and with the Indian envoys ; they did certainly not come from the court of Han. The only official mission which might have gone forward from China to Ta-ts’in direct is that of Ts’in-lun, a Syrian merchant, who had come to some port in Cochin China and was sent on to the emperor of Wu, one of the three states contending for the supremacy during the third century A.D., Sun-ch’üan, alias Ta-ti (A.D. 222-252). This monarch asked him for an account of his country ; and the details of his reply were perhaps contained in the Wu-shih-wai-kuo-chuan, regarding which I regret to have obtained no information beyond the fact of its being quoted in certain cyclopedias. Ts’in-lun supplied the information required, and, on seeing some small men of Yi and Hsi which the Chinese of the state of Wu had made prisoners in a campaign against the people of Tan-yang [= part of the present Kiang-nan Province] under the general Chu-ko K’o (a nephew of K’ung-ming, the great supporter of Liu Pei, the Minor Han Emperor), he remarked that such dwarfs would be considered a great curiosity in Ta-ts’in. The Wu Emperor thereupon ordered an official, Liu Hsien, a native of Kuei-chi (the present Chekiang) to accompany Ts’in-lun back to Ta-ts’in with twenty dwarfs, ten male and ten female. The official died en route and Ts’in-lun went home. So far the Chinese records. The mission, it appears, has never been heard of again in China, which may have suggested the idea of Liu Hsien’s death. I am not aware of mention being made of the arrival of any such dwarfs in western authors. Possibly the dwarfs died as well, if Ts’in-lun succeeded at all in reaching his home.